The Toyota Land Cruiser (لاند كروزر) is a series of four-wheel drive vehicles produced by the Japanese car maker Toyota. The Land Cruiser series is the longest running series in Toyota history and is one of the most successful SUV 4x4s on Earth today with legendary reliability and focus on special commercial enterprises operations rather on consumer alone. The legend of the name Land Cruiser began prior to WW2, the Japanese Military needed a reliable go anywhere vehicle to be produced in Japan. The simplicity and reliablity of the vehicle was a priority. At the time Japan was mostly dependent on American vehicles and trucks, the need for Japan to have their own 4x4 and other vechicles produced locally was rising. The first prototype was produced in January 1951, this first car had a B-type gasoline powered water-cooled in-line 6-cylinder 3,386cc engine, installed on a SB-type 1-ton truck chassis. At the time there were many Jeeps being driven in Japan, which had been brought in by the occupying forces, and the Jeep came to be the symbol of the 4x4. For this reason Toyota called its prototype the Toyota Jeep, and by combining a B-type engine with a Jeep model it was known as the BJ Series. The Americans were of a lot of influence, as their reliable 6 inline gasoline engine was a vital Japan copied, redesigned and perfected for their early vehicles and up to these days. Large-scale production of the Toyota BJ Series did not begin until August of 1953. It took 2 years from the decision to adopt the prototype to get ready for full-scale production. In the first year 298 Toyota Jeep BJs rolled off the production line. The next year in June of 1954, responding to claims of trademark violation by the Willys Company that produced the original Jeep, then Director of Technology Hanji Umehara renamed this 4-wheeled vehicle as the Land Cruiser. The rest as they say is history, as the Land Cruiser demonstrated global competitiveness with its rival models, and carved its name in the history book by proving to be truly worthy of its name. Models and Specifications of different Land cruiser Series are presented below to reflec the long history of Land cruisers. The automobile industry was in a fateful crisis from Japan's defeat in war and the chaos that followed it. However, military procurement enabled a recovery and the combination of the accumulation of technology from before the war and present material resulted in the development of an automobile above expectations. The chassis of the Toyota Jeep BJ was based on the SB-type 1-ton truck (with an S-type 995cc engine) that was originally released in 1947. For that reason, at 2,400mm the wheelbase about 200mm longer than that of the Jeep, and the body was also a size larger. The SB-type compact truck was commonly known as the Pony Toyota (and later the Toyopet Truck), and because it was designed as a small transport vehicle that could also double as a passenger car, its suspension settings were likewise soft. These characteristics were carried over into the Toyota BJ-type, so it gave a surprisingly comfortable ride. The engine was a 3,386cc water-cooled in-line 6-cylinder B-type gasoline engine. Jeeps being built at that time had a side valve construction, but the B-type engine was an OHV (Over Head Valve) type. The engine was originally designed in 1937, with the first prototype completed the next year in 1938, after which it was installed in the GB-type truck, the KB-type truck, and the BM-type truck, being primarily an engine for 4-ton class trucks. The capacity of the B-type engine when it was first developed was a maximum output of 75HP/3,200rpm, and a maximum torque of 21kgm/1,600rpm. Later these specs were improved by boosting the compression ratio and through other refinements, so that whereas the first model Toyota Jeep BJ model had a maximum output of 82HP/3,000rpm and a maximum torque of 21.6kgm/1,600rpm, by the late model version the power had been boosted to a maximum output of 85HP/3,200rpm and maximum torque of 22kgm/1,600rpm. This meant reserve power for the size of the body it was mounted in, so the Toyota Jeep BJ came without a LO range subgear. The Toyota Jeep BJ was completed in 1951, and first unveiled that same year at a public showing of Toyota vehicles. There were 26 Toyota vehicles displayed at this event, and during the 3-day period the attendance amounted to some 200,000 people. Moreover, the design of the Crown was begun in 1952, with the first Crown model built in 1955. FJ/BJ 20/25/26/27/29/35 produced between 1955 and 1960 and was imported to Egypt. Since just right after Japan's recovery from the war and its aftermath, Toyota already had future visions to export its domestic vehicles overseas. These forward-thinking Toyota employees knew just how important the Land Cruiser was to take this large step forward into further making their dreams a reality. The Toyota Crown was first released in Japan in the mid-1950s when Toyota was working fast to build a domestic sales network to handle the demand. It was in such circumstances that from 1956 on, as part of Toyota's strategy the company decided on what was called the Land Cruiser strategy for foreign markets. Given the fact that its performance could hold its own against rival models such as the Willys Jeep and Land Rover, Toyota decided it was the right time to expand in foreign markets, and whenever the opportunity presented itself Toyota was there with the Land Cruiser right out front. The Land Cruiser helped Toyota establish a bridgehead, and the idea was to follow with sales of passenger cars. In this way with expansion into foreign markets, Toyota gained competitive strength by making the necessary changes and improvements through model changes, thereby effectively extending its export sales channels. Whereas the BJ-type Land Cruiser was originally built for military use, its design in time was modified to serve industrial expansion in peacetime, partly for the purpose of stimulating domestic demand for Toyota vehicles. Then in 1955, alongside production of the BJ-type Land Cruiser the 20-series made its debut. The engine in the early model FJ20 was an F-type engine with a compression ratio of 6.8 and an output of 105ps. However, by the later models in the series the compression ratio had increased to 7.5, and the output to 125ps. At first, the B-type engine that was installed in the BJ25 was produced alongside the F-type gasoline engine (3,878cc, 105HP) that went into the FJ25, for which the prototype had been completed in 1948. When the B-type engine was phased out of production, leaving only the FJ-type. The wheelbase on this chassis was made a bit shorter, and the drive power improved, the 3-plate springs were replaced by 4-plate springs developed for the Crown (the BJ-type Land Cruiser had 9-plates), thereby making it a more comfortable ride. The FJ25 was positioned as the standard of the FJ20-series for the domestic market, but in all there were 10 variations available from FJ20 through FJ29. There were two variations on the wheelbase, 2,285mm and 2,430mm, and along with the FJ26, 27, 29, and others, there was also the 4x2 Land Cruiser made for the National Police Agency. In 1958 the wheelbase was extended to 2,650mm, and a van body FJ35V was introduced. After the increase of demand during the Korean War, Japanese automakers were invited to bid to meet further demand for military vehicles by supplying the U.S. Army Procurement Agency in Japan (APA). For this reason, in 1957, test vehicles supplied by Toyota, Nissan, Isuzu, and Mitsubishi, ranging from compact to large-sized trucks were gathered at the Aberdeen proving ground on the outskirts of Baltimore, Maryland for a comparative test run. This test was overseen by Toyota Chief Engineers Inagawa and Iritani. The result of the test run was that the Toyota 750kg capacity truck (2FQ15L) and the 2.5-ton capacity diesel truck (2DW15L) were adopted for procurement. The performance of the FJ25L was not bad, but unfortunately it was fated to not be selected for procurement. However, by this time the superiority of the Land Cruiser had been acknowledged by the U.S. military, and as a confidence builder, this was all that was needed to convince Toyota that the time was right to expand in the American market. The development theme for the 20-series was a new style with more driving comfort. As a result, it didn't have much in common with the Toyota BJ, instead showing more soft lines in the body styling. These major changes in the chassis frame created a basic design, which through the transition to the 40-series remained unchanged for 29 years. To improve the riding comfort first the springs in the suspension were changed. The leaf springs in the front and rear were lengthened and the number of plates reduced to 4 to create a softer cushion. In addition, rubber bushings were added to the pivot and shackle in order to dampen the vibration transmitted to the cabin. More vibrations from the suspension would be absorbed rather than transmitted to the body, if the inner channel of the side frame was extended, and the number of closed structure members was increased. The frame itself was strengthened so that the vibrations from the suspension would be absorbed rather than transmitted to the body. Compared to the Toyota BJ-type it has a more spacious interior, and the steering column has been moved more to the outside. The air-conditioner is made by Nippon Denso. The heater is located below it to the left. The FJ28V has a wheelbase that is 145mm longer than that of the FJ25. This model also comes with a 3rd seat that was installed in the luggage area. The roof is made of steel, with reinforced plates on the inside. The window area is rather small. Along with greater riding comfort, the interior of the vehicle was also made more comfortable. It was larger for one thing, and by remounting the engine 120mm forward the cabin could be extended by 200mm. The steering column was moved 10mm to the outside, which also gave more width and spaciousness to the cabin. These changes made it possible to move the parking brake lever from where it was on the passenger seat side in the Toyota BJ to a new position closer to the driver's seat. This was an improvement in operability as well. From the earliest models of the 20-series, the engine, transmission, transfer, and even the final drive gear were all basically the same unit throughout. Minor changes were made in the gear ratios of the 1st and 2nd gears favoring high speed driving, and a synchromesh mechanism was added to the 3rd and 4th gears. At the time synchromesh transmissions were being added rapidly not only to passenger cars but also to trucks. With these changes the 20-series was made available in 2 types, a short wheelbase of 2,285mm and a long wheelbase of 2,430mm. Compared to the 2,400mm of the Jeep BJ, the short version had improved maneuverability, and while the long version was only slightly longer it had a higher loading capacity. Using just these two chassis, from the BJ to the FJ, the 20-series went through a number of body variations. Rare find these days in Egypt but used to be plenty. NOTE FOR EGYPT: This includes all the FJ/BJ 40/41/42/43/44/45/46/47 produced between 1960 and 1984. Egypt imports were focused on 40/43/45. The military design work-horse for civilian use is born, 24 years of production proves that sometimes a simple old design is a good design. 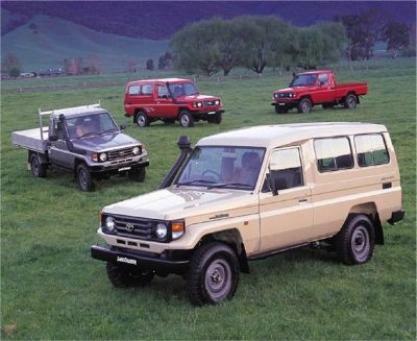 These robust easy to maintain Landcruiser were the launch and test base for all the future work-horses in the 4x4 world. Their fame preceeds them when it came to off-road capabilities as daily as it gets. Making this model, fully expanded in the variations and form it could come in. Although looking almost the same on the outside, the 20 and 40-series differed a lot on the inside. In addition, defying the eye, the construction of the body was vastly different. The 40-series, with a similar exterior vibe throughout, since expanded its range with approximately 25 years of accumulated technology advances. With the appearance of the FJ20 series the reputation of the Land Cruiser was secure, especially in foreign markets. From this point on it was a matter of pursuing higher output, better performance, and making improvements and refinements throughout. After this Toyota also put greater attention on development of passenger cars, and with the completion of the Crown, from 1958 began exporting cars to the United States. In 1960 the FJ-type took an evolutionary step into the 40-series. Though there was very little change in the external appearance of the vehicle, production techniques were modernized with the introduction of large-scale press equipment, and changes were made in processes, such as the way panels were assembled. Moreover, a LO range subgear was added to the transfer, which improved both acceleration and performance on bad roads. In addition, with the 2-speed transfer lever moved to the instrument panel and the 3-speed shift lever moved to the steering column, this made floor room so that 3 people could sit in the front. The design was so well received that few changes were made, and the first major structural development wasn't seen until the 40-series. Whereas the 20-series F-type engine had an output of 105HP, by the FJ40 the engine had an output of 125HP, which eventually was boosted to 130HP, at least for the domestic market. The 40-series lineup included the short wheelbase FJ40 (soft top and light van model), the middle wheelbase FJ43, and the long wheelbase FJ45. The FJ28 had 3 variations, a soft top, hard top, and light van model. The FJ43 came in only 2 variations, a soft top and a hard top model. The FJ45V was a van type, and there was also a pickup truck model made for export. The FJ40V was styled as a top-heavy box-like extension of the paneling on the soft top type. To reduce the added weight resinous materials were used for the roof instead of steel paneling, and the reason for raising the roof so high was for improved visibility, with a window added to the rear corner section. The unique styling had a following and was popular. In 1967 the market demand seriously increased for station wagons, and the FJ45V was replaced with a new FJ55V that had a wheelbase of 2,700mm. In 1974 the BJ series debuted, which put a B-type diesel engine in the 40-series. At the time a 2.8-liter piston displacement was thought of as the upper limit for a 4-cylinder diesel engine, but the B-type extended the piston capacity to 3.0-liters, and was developed for installation in the 2-ton trucks like the Dyna and the Coaster. As a result the weight in the domestic market shifted from the FJ to the BJ in the 40-series. Moreover, from 1967 a model was produced for export that was equipped with an H-type 6-cylinder 3,576cc diesel engine. The appearance of the BJ40 series was epoch-making for the Japanese domestic 4x4 market. Before that the FJ 4-liter gasoline engine had been classified in the Japanese vehicle registration system as a large vehicle, making it more expensive to maintain and a heavy tax liability for individuals to own. However, with the diesel engine it became reclassified as a compact vehicle, making it easier for individual users to own. Moreover, the F-type engine underwent improvements in the same year, and the FJ56V made its debut with the new 4.2-liter 2F-type engine. Drawing the curtain on a 24-year history as a long seller in Japan, the 40-series was followed by the debut of the 70-series. During this time there were few changes made in the external appearance of the vehicle, but it was continually improved from within. In particular, from the late 1960s to early 1970s, when attention was increasingly focused on automotive air pollution and manufacturing defects, Toyota put great efforts into addressing these problems. The 40-series was an extension of the 20-series short with the 25 becoming the 40, and the longer wheelbase 28 model becoming the 43. In the later stages of the 20-series a long bodied 35 becoming the 45. Thereby the 40-series inherited by body and chassis from the 20-series, and most of the changes focused on the power train. The 40-series for the first time took on a 2-speed transfer with a LO range, so in addition to being able to switch from 2WD to 4WD, now you were also able to switch from HI to LO range. On the 40-series the switch from 2WD to 4WD was made by engaging or disengaging the front wheel drive using an engine vacuum actuator; whereas the HI/LO switch was a remote control type by the mechanical operation of a lever. To switch from the 2WD to the higher 4WD range you pulled a knob, and to switch into the LO range you operated the lever. It was built in such a way that moving the lever automatically triggered the switch in a single smooth operation. The change to a 2-speed transfer was also linked to the change to a 3-speed transmission. The 20-series did not have a LO range, so it required a 4-speed transmission, but with the 40-series the gear ratio adapted to very low speeds reduced the need for an extra gear in the transmission. The operational interaction of the transfer and the transmission also underwent changes that led to increased reliability of operation. The front drive switch knob remained on the instrument panel, but the HI/LO switch was moved to a floor shift type directly on the transfer. By that time changes in the transmission reflected a shift to the 4-speed and 5 speed. The F-type gasoline engine was switched to a B-type diesel engine, with improvements in the piston displacement, and other accommodations to increasingly strict emissions control regulations. The 3.0-liter engine that had been found in the BJ40/43 was enlarged to a 3.2-liter power unit, and this B-type engine was put in the BJ41/44. Then an even larger 3.4-liter 3B-type engine, which cleared increasingly strict emissions regulations, was mounted in the BJ44/46. Famously known as the "Owl" in Egypt "البومة" with its not very attractive looks, it wasnt favoured among 4x4 users, however reliablity was of no question. The 40 series had three different body lengths all with the same face as uniqueness is a necessity for a utility vehicle with typical users that desire a sense of prestige. That was the reason why the long body FJ55V was given an exclusive vehicle body. In 1967 the FJ45V was replaced with the FJ55V, which had a 2,700mm wheelbase. The Land Cruiser made its appearance as a cross-country type 4x4 vehicle, but the market had begun to accept the idea that it also could be a utility vehicle for carrying things. For that reason the demand increased for a vehicle with a larger body that could carry more people and more cargo. Toyota's response to this demand was to build wagons like the FJ35V and FJ45V. After that the demand became strong for a real station wagon. If all you need is a vehicle to carry people or cargo, an ordinary truck can do the job. However, even if you traveled to a work site by road, once the work was done the Land Cruiser was often expected to cross ground where there was no guarantee that the roads would be passable. Depending on the weather conditions the road might wash out or become submerged under water. It was for conditions like this that people selected a Land Cruiser. It is often assumed that all Land Cruisers were assembled at the Arakawa Auto Body Co., Ltd. (now Toyota Auto Body Co., Ltd.), but actually the long wheelbase versions such as the FJ35V and FJ45V were made at the Gifu Auto Body Industry Co., Ltd. At that time there were orders from overseas for trucks that could carry 7 to 9 people, and the demand was rising for a wagon type vehicle. Plans for a wagon design were pursued with the assumption that it would be built at the Arakawa Auto Body Co., Ltd. However, as Toyota had out a priority on development of passenger cars such as the Crown and the Corona, the Toyota design staff was too busy to be free to work on the Land Cruiser. As a result, up through the 40-series, the design was handled by on site technical staff working with little more than rulers and compasses. However, from the 50-series on, at last designers were again free to pay serious attention to the Land Cruiser, creating serious design sketches and clay models. Leaving some traces of the original 40-series, they added a brand new branch to the Land Cruiser tradition and created the FJ55V. The body size was larger than that of a compact car, the ride was as comfortable as a passenger car, and it was designed not just for utility but also for leisure use. It was designed to be able to cruise at 130km/h, in view of the high-speed highways in America. It was also designed tough, to withstand the rugged treatment it was expected to get on the Australian landscape, and it was the first time that a Toyota truck was built entirely with fully enclosed box cross-section welded members. Already at this time it was engineered to meet American safety standards established through frontal crash testing at speeds of 50km/h, and all of these improvements strengthened the design of the vehicle. It was at this time that the Honda N360 became a big hit. The Toyota 2000GT, Cosmo Sport, and other genuine sports cars appeared, and for the first time Japan's domestic annual automobile production exceeded 10,000,000 units, making Japan the second largest automobile producing nation in the world. In 1975 the F-type engine underwent further improvements, becoming the 2F-type 4.2-liter engine, which was installed in the newly debuted FJ56V. The 2F-type engine had a piston displacement of 4,300cc, an output of 140PS/3,600rpm and torque of 30kgm/1,800rpm. The FJ55V had a 3-speed transmission, while the FJ56V had a 4-speed transmission. In addition, the hood design was made rounder, the triangular-shaped window was eliminated, the signal indicator was integrated into the car side lamps, and other small changes were made, but the basic design remained unchanged. The 50-series was made to be sold on the great continents of America and Australia, and because of its shape, in America it was affectionately known as the Moose. The FJ55V was the successor to the FJ45V, and was a full model change bearing little in common with its predecessor. Everything on the chassis except of the axel was completely redesigned. When the frame evolved from the 20-series to the 40-series the number of fully enclosed box cross-section members increased in the side frame, but in the FJ55V all of the remaining open-ended members were replaced with fully enclosed members. Moreover, the member assembly method was changed from riveting to welding. As a result on the FJ55V frame the wheelbase was extended by 50mm, lengthening the rear overhang, and for improved productivity assembly was divided into 3 phases. Ordinarily this kind of reinforcement would be expected to add to the vehicle weight, however even while increasing the bending strength by 20% Toyota managed to actually reduce the vehicle weight by over 10kg. The FJ55V model also had a different length in the front of the frame depending on whether or not a winch was to be installed, a station wagon design that was fully ready for the new era. FJ55V engine was essentially the same F-type engine as the FJ45V that had been used in the 40-series, however there were significant improvements made particularly in the cylinder heads. The reason for this was to raise the rpm level at which the engine produced its maximum output, aiming at better performance in high speed driving, and also improvements were made to reduce emissions. On the new cylinder heads of the F-type engine the position of the bolt-holes that fixed the heads to the blocks was the same, but the shape of the heads was completely different. The combustion chamber had the same wedge shape, but the angles of the intake and exhaust valves were both fixed at 6-degrees, the shape and numbers of the rocker arms were modified, and the entire unit was made lighter. A passenger car use compact 4-cylinder 2R-type gasoline engine camshaft was added to improve intake efficiency at high rpm levels. With the FJ56V the engine evolved from the F-type to the 2F-type, with most of the changes centering on the specs for the piston displacement and the carburetor. The cylinder bore was increased by 4mm to gain more piston displacement, and improvements were made to part of the fuel delivery system, resulting in a power boost of 10PS. The last of the true heavy duty Landcruisers, these models are a leap in luxury and space, those who drive a 60 Series enjoy the final days of simple mechanics and the beginings of luxurious Landcruisers. They are more high-way friendly as well as being very capable off-road. Used to this day by several border patrols around the Middle East and North Africa, the 60 Series is well sought after 4x4. Under the supervision of Chief Engineer Hiroshi Ohsawa in 1976 planning began for the next generation of the 50-series Land Cruiser. The first thing that was required was an expansion of the body size. In order to compete in the American market, and against rival vehicles like the Land Rover, something more was needed that went beyond what the FJ55V had to offer. It had to have more of the feel of a passenger car type station wagon, with a softer luxury touch in the interior and a more comfortable ride. The problem was what to do with the suspension. An independent suspension was considered, however this idea was rejected in favor of the existing rigid leaf springs of the FJ55V Land Cruiser, to ensure that it lived up to its name as a vehicle that was highly reliable on whatever road you might take it anywhere in the world. Eventually Mr. Ohsawa's responsibilities shifted to the 4 Runner 4WD, the job of Chief Engineer for the 60-series Land Cruiser passed to Iichi Shingu, who saw it through to its debut in 1980. In 1984 the first full model change in 29 years (including the 20-series) was made on the 40-series, and the Land Cruiser 70-series was born. At the same time, the 60-series gained a 2H-type engine matched with an A/T, the first for a cross-country type 4x4 in Japan; and the FJ62 debuted with a 6-cylinder 3,955cc 3F-type engine. In addition, the 3F-type engine was made lighter and more compact in an effort to reduce the volume of emissions, while at the same time its output was increased by 15PS to 155PS/4,200rpm, and the engine gained greater fuel efficiency. The modern work-horse, comfortable, spacious, fast and came in so many body configurations that whatever your needs are you will find a 70 thats suits you. The pressure from the preceding model sales volume was enormous. However, the 70 series was able evolve the Land Cruiser while maintaining the images of rigidity, reliability, and durability of the past. Without major alterations to the basic structure, many small details that pioneered the path to modernization were added on. In 1984 a new 70-series was born, bringing to a close a long era of 29 years (including the 20-series) during which the 40-series remained virtually unchanged. There were limits to what could be done to modernize the old design of the 40-series model. For this reason Chief Engineer Masaomi Yoshii introduced a complete overhaul in the design, producing the 70-series to lead the Land Cruiser with a new generation. The first pre-condition however was that the new Land Cruiser was not to sacrifice any of its toughness, so a strong ladder frame was outfit with rigid leaf springs. The body plates were thickened by 1.0mm for added strength. While leaving something of the image of the 40-series, such as externally added fenders, it was also given modern features such as curved glass. As before there were two body types available, the short BJ70 (soft top and van), and the middle BJ73 (FRP top). In 1985 a derivative of the BJ70 model was added, the LJ71G, which had a 2L-T-type engine (4-cylinder, 2,446cc, 85PS, 19.2kgm). As indicated by the letter G, this model was registered as a passenger car type wagon. It had a soft appearance in the front mask, and the suspension had rigid coil springs. In the export model it was known as the Light Land Cruiser, or the Land Cruiser II. Moreover, this was the same engine that was installed in the 4 Runner. At that time the BJ70 lineup was also expanded with the addition of the BJ71 and BJ74, which had a 13B-T-type turbo diesel engine. The BJ74 LX grade also came with automatic transmission. Later the Land Cruiser shifted its weight to the 60-series. In competition to outdo its rival model the Pajero in terms of luxury, the 60-series evolved into the 80-series. During this period the 70-series tended to fade into the background. Then in 1990 a significant minor change was introduced in the 70-series, when two newly developed engines were introduced; the 1PZ-type engine (replacing the 3B-type with an OHC (Over Head Camshaft) 5-cylinder, 3,469cc, 115PS, 23.5kgm engine specs), and the 1HZ-type engine (replacing the 13B-T with an OHC 6-cylinder, 4,163cc, 135PS, 28.5kgm engine specs). Moreover, to the middle length model a new ZX grade was added. Both the PZJ70 short and the HZJ73 underwent modifications. Following that in the same year the 70-series wagon underwent a complete makeover. In addition to the original 2-door, a 4-door semi-long was introduced, the name was changed to the Prado, and with other design changes it took on its own unique identity. The 4-door model had 3 rows of seats and could carry 8 people. Compared to the 70-series that was registered as a commercial vehicle, it now had more potential reclassified as an RV. The 2L-T-type was transformed with electronic controls in the new 2L-TE-type engine, which gave it improved performance. With the minor change the short version kept its LJ71 number, while the long version was renamed the LJ78. At this time also appeared a 4-door semi-long, with a choice of two engines the 1PZ or the 1HZ named accordingly the PZJ77 and the HZJ77. In 1991 the Prado semi-long had a wide body version added to the lineup. In 1993 the short also had a wide body version added, and a newly developed engine was added, the 1KZ-TE (2,982cc, NET130PS, 29.5kgm). All of this meant major improvements in performance. In 1994 the 1PZ-type engine was dropped from the van series, leaving only the 1HZ type of engine. With the full model change in 1996 it embarked on a new and independent path as the Prado. The van type underwent a series of minor changes, taking on front rigid coil springs in 1999, leading up to the present day. The concept of the 80 series was the combination of "Advanced" and "Top Quality" features at the highest level. However, the true reason why the 80 series gained worldwide attention was the fact that it able to maintain its original toughness of excellent off-road characteristics while being loyal to the above. In 1989 regular minor changes were introduced, all in the direction of greater luxury, which led eventually to the evolutionary transformation of the ever-popular 60-series into the new 80-series. At the time the 60-series was being driven more for leisure or family use, and as a town car, than as an off-road vehicle. Over time the demand increased for more fashionable and passenger car like characteristics. The response to this market demand was the 80-series Land Cruiser. The aim of the 80-series was to be both at the forefront of technology and luxury. Along with passenger car like styling in the front design, wide tires and large fenders gave it a bold effect, looking something like a luxury battleship that could cruise the land. It was a break from the tradition of the Japanese 4x4. Moreover, accommodations remained for off-road applications, such as space in the instrument panel to install wireless communications equipment, and a rail for mounting a roof carrier. It was large at 5 meters length and 2 meters wide, with 3 types of engines to choose from; the 3F-E-type gasoline engine, the 1HD-T-type direct-injection diesel turbo engine (4,163cc, 165PS, 37.0kgm), and the 1HZ-type diesel engine. For all but one type of model in the series, it came with rigid coil springs in front and rear, and a full-time 4x4 power train. Of course the top of the line van and wagon offered a VX Limited grade. owever, luxury has not softened the Land Cruiser. It has not sacrificed its ability to take on the toughest roads the world has to offer. No matter that it is more comfortable and luxurious to ride in, the Land Cruiser remains the Land Cruiser, which is the reason for its lasting popularity. The transition from the 60-series to the 80-series was more drastic than that from the 50-series to the 60-series. A number of new technologies were introduced, and it was more of a revolutionary change than an evolutionary one. The only engine that was kept on as it was from the 60-series was the 3F-E-type, while the diesel 1HD-T and the 1HZ-type that had also been used in the 70-series underwent major improvements not only in power but also in reduced noise and vibration, making it a new generation diesel engine. The new engine design included thicker cylinder walls with reinforced ribs, thoroughly researched through computer analysis. Moreover, the cylinder head cover and other parts that did not need to be reinforced were replaced with resinous parts, enabling the new engine to be stronger, lighter, and more compact at the same time. The 80-series lasted for about 9 years, during which both the gasoline and the diesel engines evolved. The gasoline engine progressed from the 3F-E type to the 1FZ-FE-type, which was a DOHC with 4 valves on each cylinder. The diesel engine progressed from the turbo spec 1HD-T-type to the 1HD-FT-type, which was also a 4-valve per cylinder type. In the power train, the transfer gained a central differential, and all but one grade had a full-time 4x4 system. A switch on the instrument panel enabled you to go from 2WD to high-range 4WD, while a lever on the floor enabled you to directly shift into LO range 4WD. This so-called HF2A transfer had electronic controls for locking the central differential when you wanted to, so that according to ground conditions even in part-time 4x4 mode you could drive effectively on bad roads. Moreover, there was also a maker option for an electronic differential lock mechanism on the front and rear axle, which enabled you to travel even further on bad roads. In the suspension, leaf springs were replaced with coil springs in front and rear. This maintained strong durability, while at the same time improving driving comfort and steering stability. There were 3 arms supporting the axle in the front, and 5 in the rear. Each arm had rubber bushings on the pivot portion, which were designed to provide strong axle support as well as reduce shocks and vibrations coming from rough road surfaces. The overall result was improved riding comfort. Demand for a 4WD with easy-to-ride characteristics naturally grew with the enhancement of user types experienced during this particular time. Gaining momentum from these demands, the Mitsubishi Pajero began to aggressively expand its market share. That was the main reason for the introduction of the 90 series Prado. The 80-series was a tough competitor in the market, boasting better performance than its rival model in the class below it, the Mitsubishi Pajero. It did not really hold a candle either to the van type series, which had fully independent suspension, 3 rows of seats, driving comfort and luxury on a par with a passenger car. Even though they were in different classes by spec, the closer rival for the Mitsubishi Pajero was really the Toyota 4 Runner. Toyota was aiming for supremacy in all classes, so it developed the 90-series Prado as its final weapon against the Mitsubishi Pajero. In addition to the standard size body there was also a wide-size body version, a sporty 3-door model as well as a 5-door model, which were all easy to distinguish from the outside. The 90-series Prado had a wide and low form, and looked amazingly similar to the Mitsubishi Pajero. Even the engine had similar specs, with two choices for the power unit, the 5VZ-FE-type gasoline engine (24-valve V6, 3,378cc, 185PS, 30.0kgm specs) and the 1KZ-TE-type diesel engine with intercooler (2,982cc, 140PS, 34.0kgm specs). The power train was a full-time 4x4, so that the lineup was clearly a front on comparison with the Mitsubishi Pajero. The Prado lineup included the KZJ90 short (diesel engine), the VZJ90 (gasoline engine), and in the long the KZJ95 (diesel engine) and the VZJ95 (gasoline engine). Like the 80-series, the long also offered a model called Active Vacation built for camping. This decision led to a big market success. It was featured in a television commercial, quite unusual for a 4x4, and it overtook the Mitsubishi Pajero as planned. In 1997 a new engine was added, the 3RZ-FE-type gasoline engine (DOHC (Double Over Head Camshaft) in-line 4-cylinder, 2,693cc, 150PS, 24.0kgm specs), widening the variations. As the 90-series developed new variations were added to the lineup, and more off-road 4x4 mechanisms were added. To cope with increased vehicle weight a new 4-cylinder 3RZ-FE-type gasoline engine was selected, and the 1KZ-FE-type diesel engine was replaced with a direct fuel injection 1KD-FTV-type that has greater output, lower fuel consumption, and cleaner emissions. Moreover, Active TRC was added to the drive train, which helped maintain constant delivery of drive force by automatically applying the brakes to any tire that began to spin when driving on uneven ground, enabling you to take full advantage of the existing traction in the other tires. This made the Prado both safer and more aggressive at the same time.